Denny Hamlin finished eighth in Sunday’s NASCAR Sprint Cup Series race at Dover (Del.) International Speedway in the #11 FedEx Office Toyota, forced to pit for a splash of fuel with 10 laps remaining after running in the top-three throughout the day at the ‘Monster Mile.’ The 31-year-old Virginia native started on the pole — his third of the 2012 season — and led the race’s first 34 laps before giving way to Joe Gibbs Racing teammate Kyle Busch. From there, Hamlin remained in the top-three for the majority of the 400-lap event won by Brad Keselowski, keeping pace with Busch and Jimmie Johnson through the race’s midpoint. However, the event’s final caution came outside the FedEx team’s fuel window, and barring another yellow flag, they were six laps short on gas. As the laps clicked green and others were able to stretch their fuel to the distance, Hamlin dove to pit road from the lead on Lap 390 for a splash of gas and finished eighth. The finish kept Hamlin third in the Chase standings following Dover, 16 points behind leader Keselowski after three of 10 playoff races. The Series returns to action at Talladega (Ala.) Superspeedway on Sunday, Oct. 7. The Series shifts to Talladega Superspeedway for Sunday’s 500-mile event on the 2.66-mile, high-banked oval, Round 4 of the 2012 Chase for the Sprint Cup championship. Hamlin has three top-five finishes and five top-10 results in 13 previous starts at the 2.66-mile high-banked oval, including a career-best third place run in the spring 2008 event. 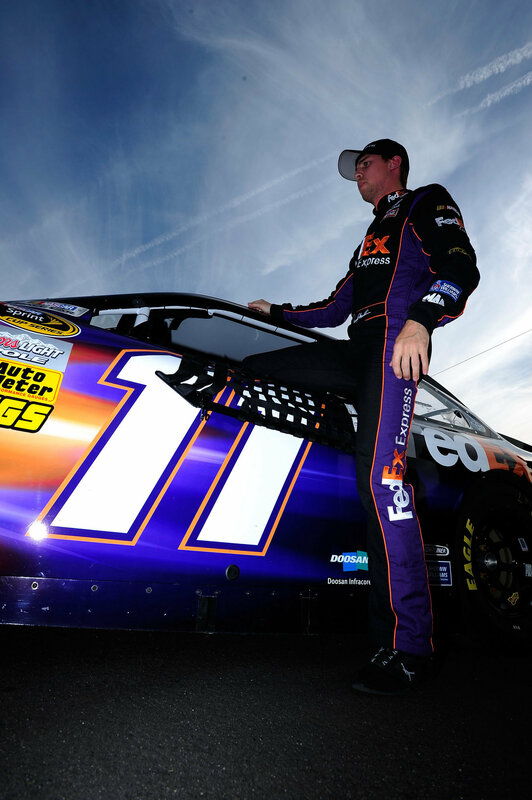 The #11 FedEx car has consistently been one of the fastest at Talladega over the years, with Hamlin leading at least one lap in his first 11 starts at the track, and has led 10 or more laps in six events. Hamlin finished eighth in the Chase race at Talladega last fall and fourth in the season’s first restrictor plate racing — the Daytona 500. The FedEx Freight service center in Madison, Ala., covering northern Alabama, will be recognized with its DCU code letters on the b-post of the #11 FedEx Freight Toyota this weekend. FedEx Freight Priority now has the fastest published transit times of any nationwide LTL (less than truckload) service.